Lots of comics to check out this week, including of course the much-anticipated finale to the "Death of the Family" event! Let's sink right in, shall we? 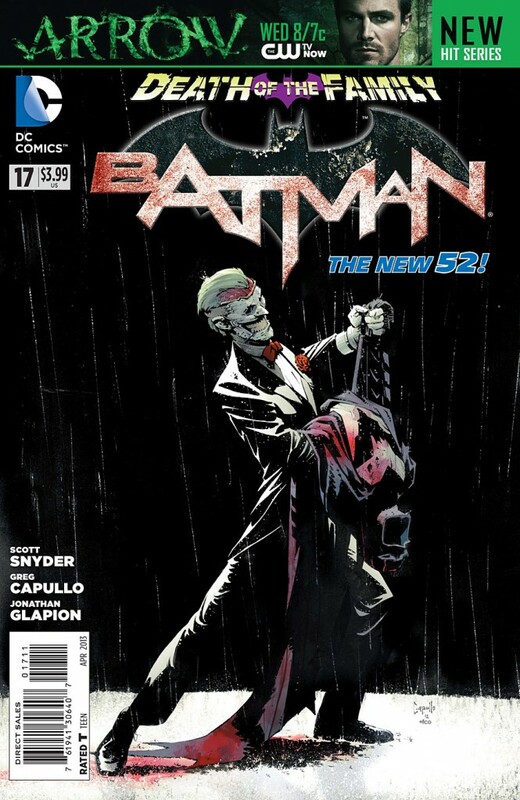 Batman #17 - "I so hope you like it everyone...I made it with lots of love!" "Death of the Family" ends tonight in the caverns beneath Gotham City, as the Joker's plans for his "Bat-King" come to fruition! The Clown Prince has managed to capture and subdue Nightwing, Red Hood, Red Robin, Robin, Batgirl and even poor Alfred and it's up to the Dark Knight to try and salvage what's left of his family, now that the clown's had his way with them! Who knows what might have happened to them while they were alone and helpless in the dark with the maniacal master of mirth?? Of course, Batman isn't the only story this week! Superboy, Batgirl and more after the JUMP! 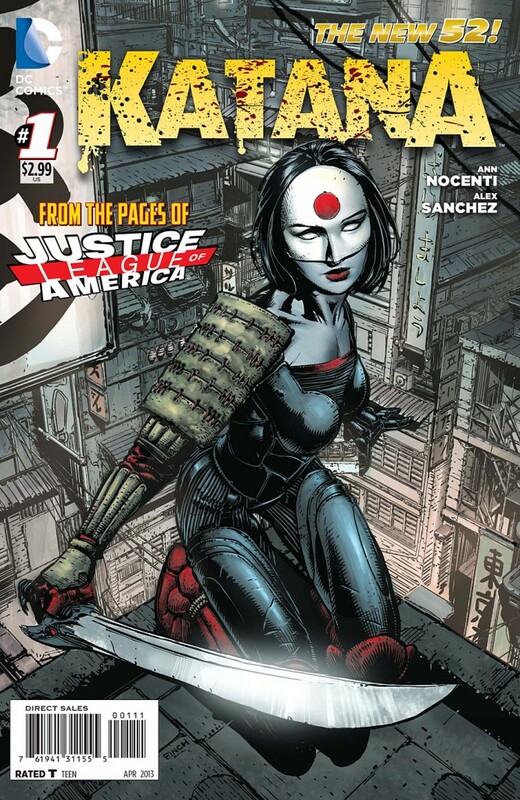 *NEW* Katana #1 - "Thirty-three opponents. Assaulting me from all sides. If I am worthy of my Katana, my Soultaker, I will block them all." In support of Justice League of America (issue #1 due out next week!) 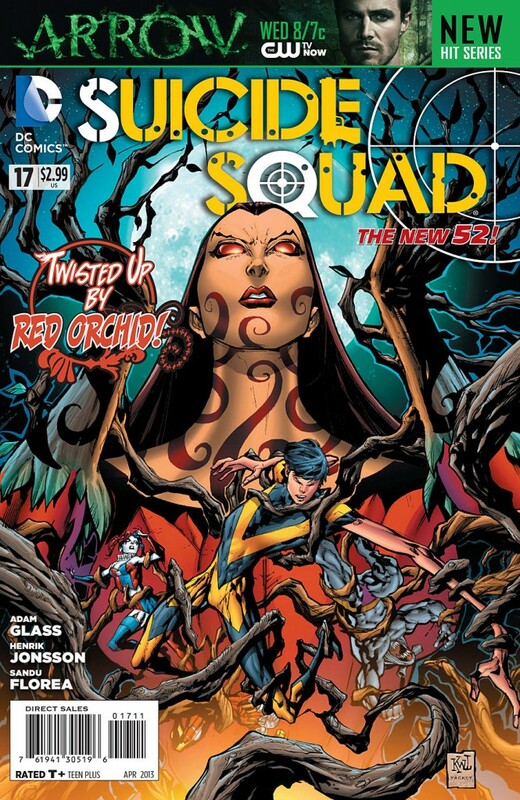 comes this new title featuring ex Birds of Prey and new JLA member, Katana! 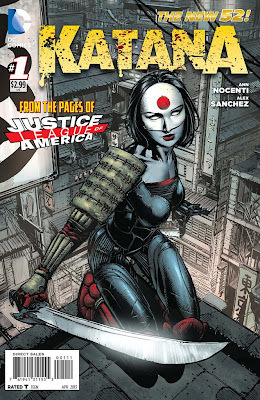 In this first issue, we learn that Katana has moved from Gotham City to San Francisco, specifically to a hidden Japanese suburb, in hopes of finding a sword master and increasing her skills! We don't really know what her agenda is as of yet, but whatever it may be Katana does NOT feel that she's adequately prepared! Sadly, Katana's search for a teacher leads her instead into trouble with the Sword Clan...an organization she clearly has a past with! Specifically she must battle the master of the spiral sword, a man named Coil! Artist Alex Sanchez and Writer Ann Nocenti do a good job on this first issue! The art in particular is quite nice. I'm a little concerned about the writing as I wasn't a big fan of Nocenti's issues of Green Arrow or Catwoman, but I hear she's done great things on Daredevil back in the day, so here's hoping she finds her muse with Katana! So far so good! 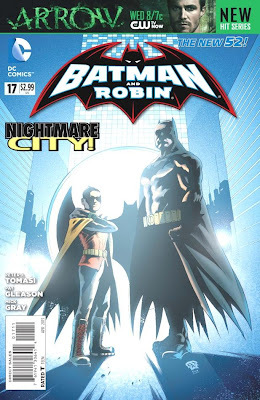 Batman and Robin #17 - "I told you that was ENOUGH." Another really great character-building issue of Batman and Robin this month! Damian, Bruce and Alfred have all had a series of long days and a long battles lately...here's a night in the lives of each as we peek into their dreams! When you live in Gotham City and regularly take a stand against hate, violence, death and psychotic clowns, even your dreams are a questionable refuge at best! I feel like we learn a lot about our characters through their subconscious journeys this issue, and in particular Damian! That's two issues in a row (counting the Annual) that really focus on what makes the newest Boy Wonder tick! He's not all attitude and fists, after all! 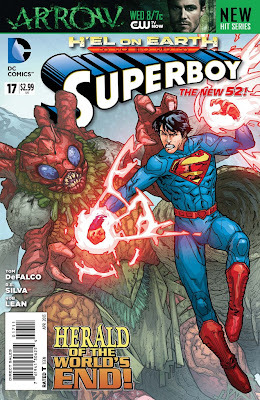 Superboy #17 - "The time has finally come for me to take an active stand--for my World and for Myself!" "H'El on Earth" continues to impress as H'El and Supergirl activate the Star Chamber inside the Fortress of Solitude and begin draining the Sun of it's power, all in their effort to travel back in time and somehow stop Krypton from blowing up. Superman, Wonder Woman and a still-reluctant Superboy are determined to stop them. The rest of the Justice League are running rescue operations trying to save the Earth from the already devastating consequences of the Star Chamber, as it has the Sun shooting off flares like a sinking ship lost at sea. Superboy really turns a corner this issue...since this cross-over began, and even before, he's been a reluctant hero at best, far more reactive than anything and just going along with the people around him, whether they be the Justice League, the Teen Titans, the Ravagers or whomever! This is the issue when Superboy decides to take charge of his OWN destiny! Even if it means he has to die at the hands of...Supergirl?? Batgirl #17 - "There it is again. 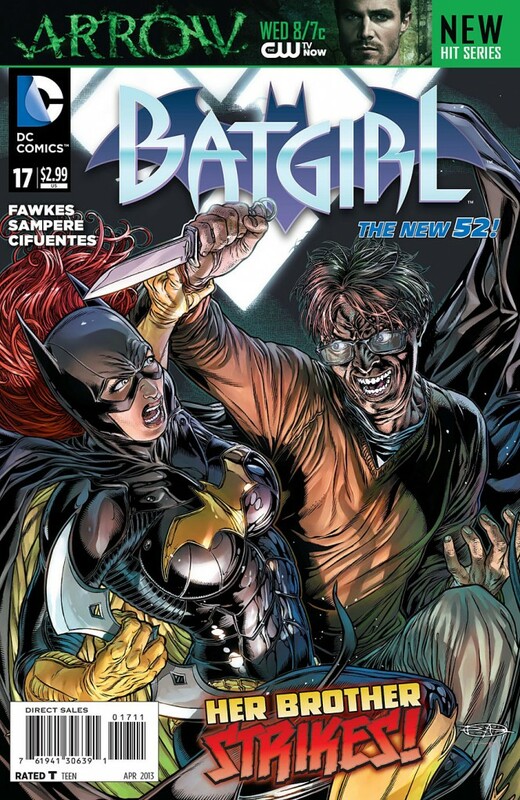 The dark threat of Gotham City..."
I like what they've done with this month's issue of Batgirl! 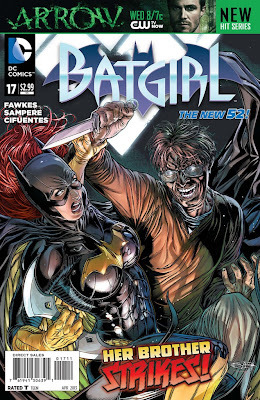 Guest writer Ray Fawkes and penciller Daniel Sampere change the focus of the book by changing the narrator from Batgirl to her brother, James Jr., who is watching her from the shadows as an exhausted and barely recovered Batgirl tries to help the wounded and undermanned GCPD round up the Joker's gang! The only problem...the Joker's henchmen appear to be blowing themselves up (not to mention the arresting officers!) rather than be taken into custody! Now Barbara suddenly feels responsible for putting all these poor rookie cops into danger...which may just be part of her brother's insidious plan! I guess we'll find out...next month! Suicide Squad #17 - "Sometimes you've got to take a little damage...to blow someone's brains out." It's brother versus sister as the Suicide Squad is sent to "retrieve a package" from Red Orchid, crime boss and sister of the Squad's answer to Plastic Man, Yo-Yo! Lots of interesting character tidbits are shared here, all in the midst of a really fun ninja-killing romp through a Chinese garden/temple/crime-lord hideout...We learn a quite as bit about Yo-Yo and Red Orchid through some flashbacks, and we also get some nice character moments with Deadshot and Harley! Even King Shark and new guy Voltaic get a little development! It's nice to see the second stringers in particular get some attention. The Ravagers #9 - "Dr. Caitlin Fairchild on the wrong side of the law? Just what is this world coming to?" Fairchild and her young team of misfits have arrived in the tiny mountain town of Hartsville, Colorado to confront their enemies, Warblade and Rose Wilson. Of course, Fairchild doesn't realize that everyone in the town is going to die very soon and that the two "villains" are actually working to SAVE the town! The joke's on our "heroes" as this issue, THEY become the "super villains"! In any case, all of the Ravagers on BOTH sides are shown an example of what a REAL hero does in times of trouble, as the Sheriff of this tiny town proves his worth in the strongest story I've yet read in this book! This is a great, satisfying two-part story from a book that until recently I've been on the verge of dropping! What a great turn-around! Kudos! 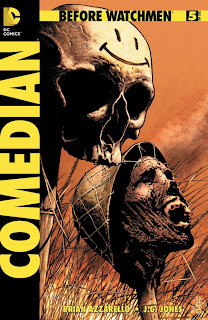 Before Watchmen: Comedian #5 (of 6) - "The one thing no one ever got about me..is that I am a Patriot." 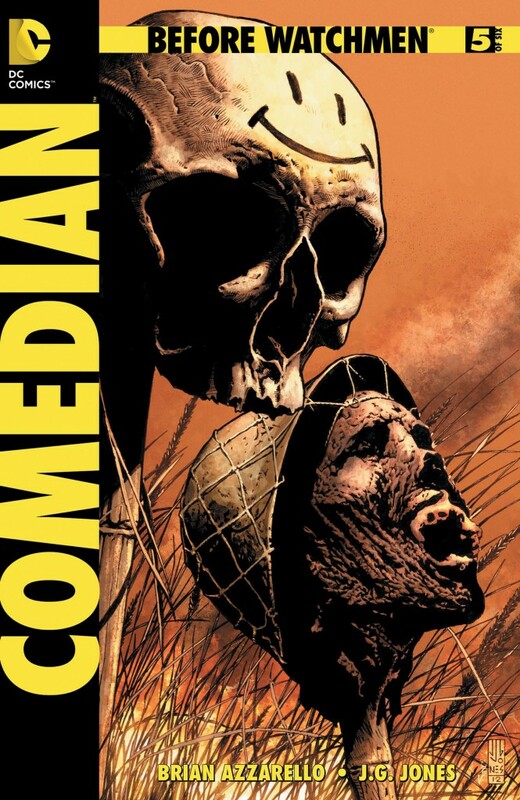 Edward "The Comedian" Blake is still fighting the Vietnam war, and of course he's doing it with extreme prejudice. The U.S. Government is learning the hard way that they have no control over the Comedian's actions whatsoever as he works hard to be the biggest monster in the jungle. I'd say he's succeeding, too! And so another week concludes! A lot of really good comics this week! And of course come New Comic Day tomorrow, we get even more! The aforementioned Justice League of America #1, of course, and also Action Comics #17 - the second last (and double-sized) Grant Morrison issue! Not only that, but we also get new issues of Green Lantern, Justice League, Wonder Woman and more! Stay tuned!! Oh yeah, my search for a record player continues over at Stryder's Dementia...take a peek if you're so inclined..